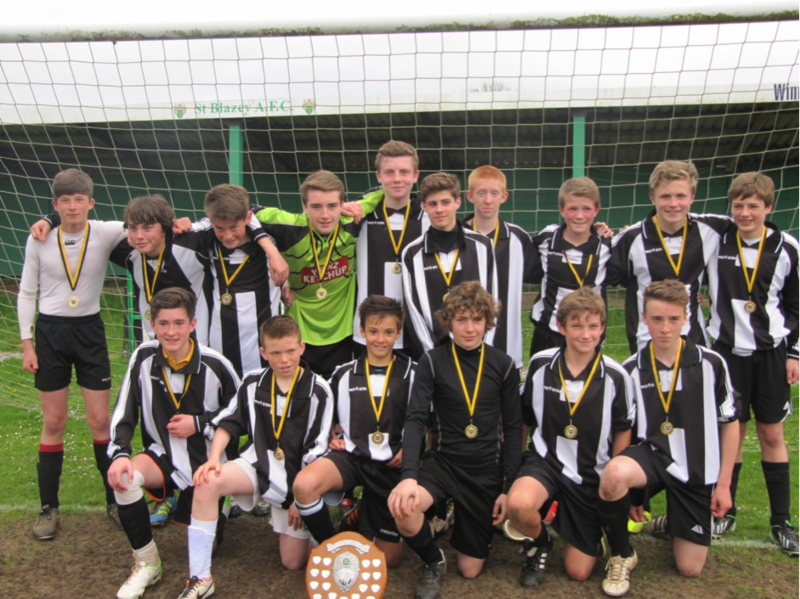 Congratulations to our U14 football team for becoming county champions! 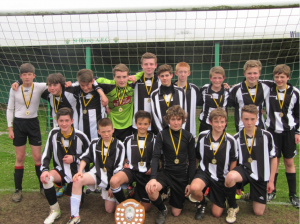 Saltash.net won the u14 county final 3-1 to become county champions in an exciting and very close game against Hayle school. The game was very even in the first half with saltash.net having a couple of good chances to take the lead. However, Hayle were very dangerous on the counter attack and had two very quick and strong wide players who caused the Saltash defence a lot of problems. It took two very good saves from Ashley Kane to keep Hayle from scoring. Gradually Saltash got to grips with the game and after a good passing move which opened up the defence, George Soper scored to make it one nil. At the start of the second half, Hayle came out in a very determined mood and scored very quickly to level the scores. They then dominated play and put the Saltash defence under huge pressure and the Saltash team looked very tired after playing so many matches in such a short space of time (some of the boys had played 4 matches in 9 days!). However, the Saltash team showed a great deal of character and belief by defending well and taking the lead after another very good finish from George Soper. The game was end to end with Hayle taking more risks and throwing more players into the attack but that left space at the back and Will Bunning exploited this with a fine run before shooting into the top corner of the net for an excellent goal which sealed the game and this saltash.net team were county champions for the second time. This is a great achievement by the team with many of the boys feeling the effects of fatigue after so many recent matches. Mr Reynolds had stressed the need for positivity, everybody working together and a supportive team spirit and this certainly showed in the match and was epitomised by the captain Ryan Winfield who led the team superbly, despite having a back injury that forced him off near the end.